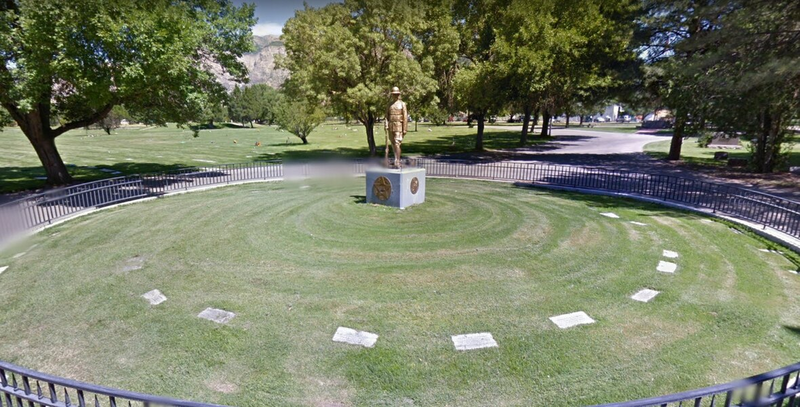 (Google Maps) An iconic statue of a “doughboy” in the Ogden Cemetery has been restored in time for the centennial of the end of World War I.
Ogden • An iconic statue of a “doughboy” in the Ogden Cemetery has been restored in time for the centennial of the end of World War I. The Standard-Examiner reports the statue has been cleaned and repaired and will be rededicated at a ceremony Saturday. “Doughboy” was the nickname given to members of the U.S. Army or Marine Corps during World War I, which ended when German signed an armistice agreement with the Allies on Nov. 11, 1918. The Weber County Heritage Foundation started raising funds to restore the sculpture two years ago. It was created by Gilbert Risvold and dedicated in the 1920s. The statue formerly stood at an old American Legion Post but was relocated to the cemetery shortly after World War II.